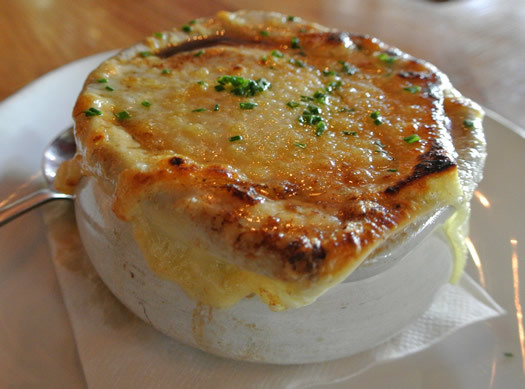 A good French onion soup (FOS) should be topped with a molten layer of cheese. A great FOS should be broiled until crackling shards of nearly-burnt dairy can be broken with the smack of a spoon's back. Once the cheese has been burrowed through, a hearty slab of baguette is all that remains before delving into a mid-layer of briny broth and a base layer of onions clinging to their final moments of life. What I've described sums up the FOS at The Ginger Man on Western Avenue. Chef Ian O'Leary takes a ubiquitous bistro-style menu item and elevates it to its best potential. There are a few key components to O'Leary's interpretation of the soup. First are the onions (it is onion soup, after all). O'Leary cuts each onion in half, and then slices thin semicircles around the core of the onion, instead of vertically dissecting the onion as most would. Picture the onion as Earth: Cut the onion from the North Pole to the South Pole. Lay half of the orb on its flat side, then begin to slice the onion starting at the South Pole diagonally towards the mock-Earth's core, working towards the Equator, then the North Pole. Make sense? Good -- that's what O'Leary is doing, except with fancier knifes and more deft skill than likely you or I have. The purpose here is that O'Leary's method changes the way the the onion breaks down as it's cooked. Instead of ending up as lifeless, fibrous strings, the final product is silken strands of onion that are cooked nearly to the color of molasses. The onions nestle in the bottom of the soup crock and melt in the mouth. While many eateries relegate FOS to an overlooked, obligatory menu fixture, O'Leary's soup feels like a small luxury that aims to highlight what FOS should be, instead of something just to fill out a menu. It's worth the two extra bones to get the Gruyere, as it is the classic cheese option for FOS and offers an assertive, nutty taste that helps break up the rich saltiness created by the broth and onions. The Gruyere option is not listed on the menu, and you won't be asked about it, so be sure to make special mention to your server if you plan on trying it. 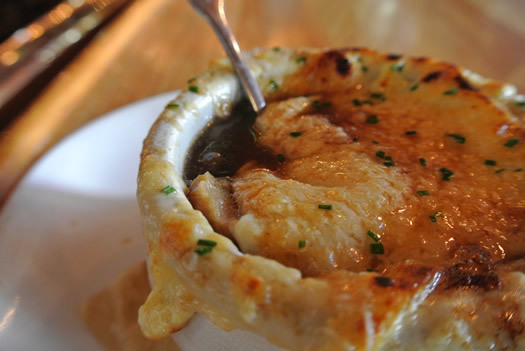 A cup of French onion soup at the Ginger Man is $3.95, while a crock costs $5.95. At this price, you get the delicious soup described above, topped with Provolone cheese. O'Leary has also created a secret sub-order for the soup, tacking on a two dollar upcharge for the use of specially crafted, six-month-old "baby" Gruyere cheese in place of the Provolone. (The Gruyere is sourced from The Cheese Traveler, on Delaware Ave, and is also used on The Ginger Man's beef short rib sliders.) It's worth the two extra bones to get the Gruyere, as it is the classic cheese option for FOS and offers an assertive, nutty taste that helps break up the rich saltiness created by the broth and onions. The Gruyere option is not listed on the menu, and you won't be asked about it, so be sure to make special mention to your server if you plan on trying it. Eight dollars for a crock of soup might sound like a crock of something else to many, but this soup is a satisfactory midday meal, and that price is on- or below-par as compared to upscale dining options in the Capital Region. The space at the Ginger Man -- with its copper accents, wood paneling, and reference to Irish writers and poets -- is a good setting to enjoy the soup, especially on a damp early spring day, perhaps the last days of "soup season." The restaurant itself has been a longstanding fixture in the Pine Hills neighborhood. Its romantic bistro dÃ©cor and quaint outdoor seating area feels better suited to Center Square, or even a side street in downtown Saratoga Springs, than squeezed between a block's worth of college bars and apartments. 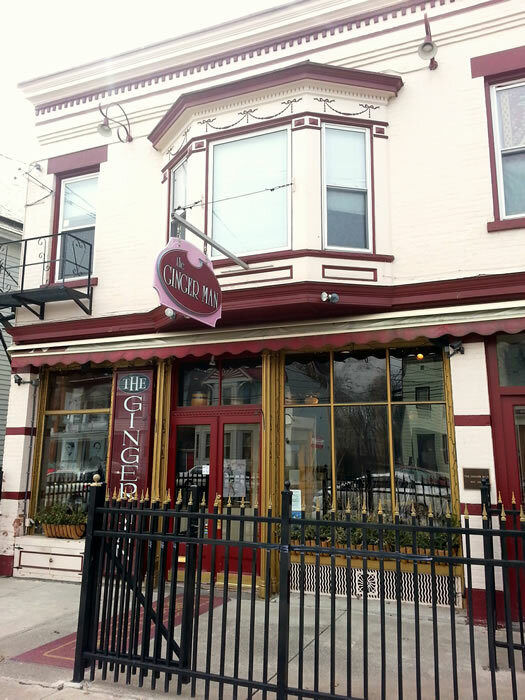 Regardless of occasionally overstepping a rogue beer can on the sidewalk, The Ginger Man attracts a clientele that ranges from business people holding a lunch meeting to a group of ladies catching up over wine and fondue. For more delicate palates, the soup might seem a bit on the salty side; however, for a variation of the traditional dish, I doubt one could find a better version than the Gruyere-topped FOS offered at The Ginger Man. Deanna, have you ever had the french onion soup at Garden Bistro 24? It's phenomenal stuff, and if the Ginger Man's version is even better, I think I know where I'll be eating this weekend. Oh, and welcome to AOA! I was worried you didn't have enough on your plate. So happy to see this piece is written by Deanna Fox. Im a fan. I usually like my french onion soup topped with a Fontina because its melting temp is optimum, but the Gruyere has my mouth watering. @Amy - Hi! Thanks for commenting. No, I've never had the French onion soup at GB 24. I haven't been there is a while, in fact, so I think it's about time I made a return visit. Thanks for the recommendation! @Deanna - Thanks! I'll be interesting in hearing how they compare. @burnt my fingers - yeah, never enough to do. Le sigh. @susan - you are too sweet! Thank you. @learn french - this makes total sense, when you think about it. I am keeping this tip handy.